Celebrating with the whole gang. May 26, World Dracula Day, celebrates the publication of Bram Stoker’s Dracula in 1897. This year marks its 120th anniversary. Picture: Victor Ambrus/The Illustration Cupboard. Today is World Dracula Day which commemorates the publication of Bram Stoker’s Dracula on May 26, 1897—this year marks its 120th anniversary. To celebrate this momentous occasion, we have a few treats for you. First, be sure to read Erin Chapman’s report on the Fourth World Dracula Congress, held at Trinity College Dublin between October 20–21, 2016. The event was organised by the Bucharest-based Transylvanian Society of Dracula, which folded shortly after. The North American chapter (which I’m a member of) was handed the reins. You can read more about the transition in my interview with Daniela Diaconescu, the Vice-President of the Transylvanian Society of Dracula. But much like the count himself, the congresses aren’t down yet—their spirit will live on with the Children of the Night Cross-Platform Dracula Congresses organised by Florin Nechita, Hans Corneel de Roos and Magdalena Grabias. The first congress is scheduled for October 17–19, 2018 at the Transilvania University of Brașov. See its website for details: https://dracongress.jimdo.com/. World Dracula Day Symposium 2017 line-up. Dacre Stoker, J. Gordon Melton, Thomas Garza, John Edgar Browning, Elizabeth Richmond-Garza, Nancy Rosenberg England and Dax Stokes. Picture: North Central Texas College/Dax Stokes. Speaking of Dracula congresses, North Central Texas College in Flower Mound, TX, is hosting World Dracula Day Symposium 2017 on May 25–26, 2017 to celebrate Dracula‘s 120th anniversary, as covered by North Texas’ Leader and the Dallas News. The event is also a sort-of sequel to There Are Such Things! Vampire Studies Symposium 2015, held at the college’s Corinth location on October 31, 2015, attended by me and my colleague, Erin Chapman, who wrote about the event for our website. Both events were primarily organised by Dax Stokes, whose podcast, The Vampire Historian, tied with Vamped this year for the Lord Ruthven Award for Media/Popular Culture. Vamped is supporting the event (in spirit, as we weren’t able to attend this year) along with the college, Stokes’ podcast, the Hilton Garden Inn and the Whitby Dracula Society 1897. Dacre Stoker, Bram Stoker’s great-grand-nephew, is providing the keynote address. Other speakers are J. Gordon Melton, Thomas Garza, John Edgar Browning, Elizabeth Richmond-Garza, Nancy Rosenberg England and Stokes. Here’s a flyer for the event as a keepsake, if you’re unable to attend. Visit the college’s website for details: http://www.nctc.edu/dracula. A Vamped Exclusive: The Earliest Known American Serialisation of Dracula—Found! We are honoured to host an exclusive report for Vamped by Dracula scholar, Hans Corneel de Roos. He’s probably best known for his work with the 1900 Icelandic version of Dracula, Makt myrkranna (Powers of Darkness), which De Roos had translated into English as Powers of Darkness: The Lost Version of Dracula (2017). De Roos’ report, titled “Next Stop: Chicago! 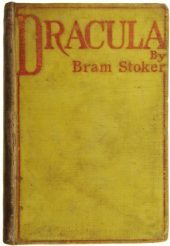 Earliest U.S. Serialisation of Dracula Known So Far Discovered. Was It the Source of Mörkrets makter?,” discusses one of his recent discoveries: an early American serialisation of Dracula, pre-dating current assumptions by months—but also adding a twist. Shortly after the publication of De Roos’ translation of the Icelandic version, he was tipped-off about a Swedish version which the Icelandic translation appears to be based on. That version was called Mörkrets makter—and it may be connected to the American serialisation. De Roos believes that due to certain spellings and connections between the people involved in both works, the Swedish version may have been adapted from the American serialisation. Ah, Dracula. What a tangled web you weave! If you’re interested to find out just how far down the rabbit hole these connections go, check out our exclusive coverage of De Roos’ findings. You’ll find his full report there, too. 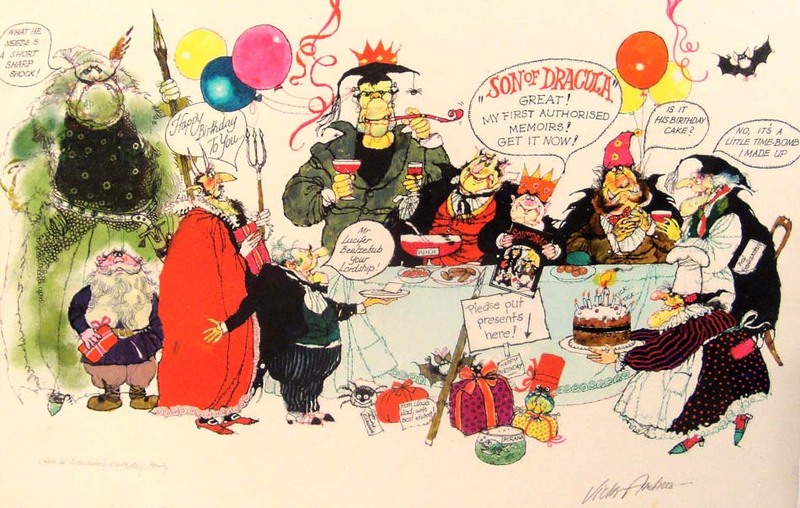 Erin Chapman’s report on the Fourth World Dracula Congress: Erin Chapman, “I Attended the Fourth World Dracula Congress. 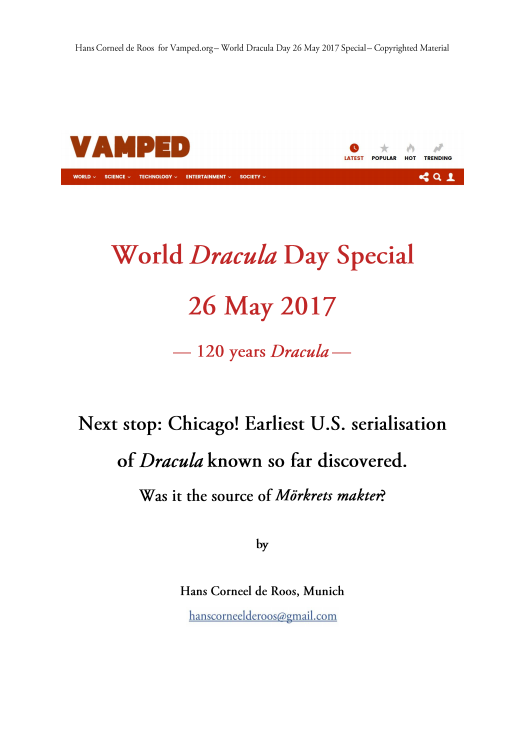 Here’s What I Thought About It,” Vamped, May 26, 2017, http://vamped.org/2017/05/26/i-attended-the-fourth-world-dracula-congress/. my interview with Daniela Diaconescu: Daniela Diaconescu, “Interview with Daniela Diaconescu, Vice-President of the Transylvanian Society of Dracula,” by Anthony Hogg, Vamped, January 21, 2017, accessed May 26, 2017, http://vamped.org/2017/01/21/interview-daniela-diaconescu-vice-president-transylvanian-society-dracula/. 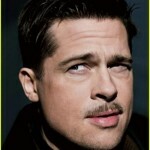 Leader: Staff report, “World Dracula Day Symposium to Take Place at NCTC,” Leader, March 27, 2017, accessed May 26, 2017, http://starlocalmedia.com/theleader/news/world-dracula-day-symposium-to-take-place-at-nctc/article_55fd7b22-1318-11e7-b860-3fb7725cfee1.html. archive.is link: http://archive.is/XaC3X. Dallas News: Tommy Cummings, “Descendant of Dracula Novelist Headlines a Conference You Can Sink Your Fangs Into,” Dallas News, May 23, 2017, accessed May 25, 2017, https://www.dallasnews.com/life/life/2017/05/23/bram-stoker-dracula-novelist-headlines-conference. archive.is link: http://archive.is/wWb3K. check out our exclusive coverage of De Roos’ findings: Anthony Hogg, “World Dracula Day EXCLUSIVE: Earliest American Serialisation of Dracula—Found!” Vamped, May 26, 2017, accessed May 26, 2017, http://vamped.org/2017/05/26/world-dracula-day-exclusive-earliest-american-serialisation-dracula-found/. The Whitby Dracula Society 1897 has an official website for World Dracula Day, which also hosts social media for the event. Visit: http://www.worlddraculaday.com/. Previous article World Dracula Day EXCLUSIVE: Earliest American Serialisation of Dracula—Found!